In 1963, Herbert Feemster was working as a janitor in Washington, D.C.; barely in his twenties, he had married young and begun a family. At about the same time, Francine Hurd was putting together a high school girl group called The Darlettes. Marlene Jenkins was in New York City making records under the name Marlina Mars; two singles ("The Correct Form" and "Just For the Book") were released that year on Capitol. Linda Greene was just a kid. Patrice Hawthorne hadn't been born yet. Together they would have made an interesting if lopsided five-member act, though that obviously wasn't possible. Yet they're all connected: one persistent male and a succession of female singing partners nicknamed "Peaches"...only the number didn't stop at four! By the time the summer of 1965 rolled around, Hurd was going by the professional name Francine Day with her Darlettes trio, friends Dyanne Stewart and Nancy J. Johnson. Music producer Van McCoy (who'd started in the business as a singer) produced their recording of "Lost," a melancholy ballad with a lead vocal by Francine. Marlina Mars, meanwhile, had journeyed to Chicago for the opportunity to work with Carl Davis and Curtis Mayfield on a single for Okeh, "Just Another Dance." Back in D.C., Herb and his wife Yvonne Feemster had welcomed another child to the family, which made the day-to-day struggle of living on a janitor's wage that much more difficult. Herb was confident he had the talent to make it in the music world. He took a night job at Waxie Maxie's (the hottest record shop in the District of Columbia, founded in 1937 by Max Silverman), located at 9th and T Street N.W., about four blocks from the famous Howard Theatre. It was well known that music industry heavies would often stop by the store after shows at the Howard...and Herb's plan was to charm some of them...not a simple task! After several months he'd become frustrated but was not ready to give up; McCoy wandered in one night and Herb bust into song. This led to a meeting with Van's partner Dave Kapralik and plans were set in motion as they altered their new discovery's name to something more marquee-ready: Herb Fame. The Darlettes went through some changes, though the lineup remained intact. In '66 they were The Sweet Things and had a limited contract with Date Records (a Columbia subsidiary established about a year earlier). A Van McCoy song, "You're My Loving Baby," was the first of two singles by the still-teenage girls. Shortly afterwards Herb Fame's only solo 45, frantic dance tune "You're Messin' Up My Mind," came and went too quickly. The title of "I'm in a World of Trouble," the Sweet Things' second disc, could be interpreted as a bad sign for Dyanne and Nancy...confirmed when Kapralik squeezed them out in the process of trying to come up with a winning formula. Herb was introduced to Francine (whose mother had given her a fuzzy, fruity nickname when she was young, one she would find unexpectedly useful); Peaches and Herb, an unmistakable play on the phrase "peaches and cream," would be taking the next stab at stardom. 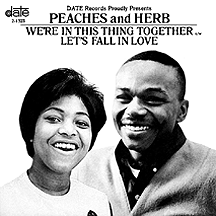 The duo recorded McCoy's "We're in This Thing Together," an upbeat ode to love released in the summer of 1966 (the picture sleeve reused a photo of Francine from the cover of an earlier Sweet Things single). Nothing happened until September, when the flip side, "Let's Fall in Love" (a Harold Arlen-Ted Koehler chart-topper from early 1934 for bandleader Eddie Duchin with vocalist Lew Sherwood), started getting airplay in St. Louis, Missouri at KATZ (a soul station) and KXOK (a mainstream top 40 station), then began to catch on at a smattering of stations in the eastern part of the U.S., gradually making its way west, still solid in early 1967, top ten in many cities prior to spending the month of March in Billboard's top 30. 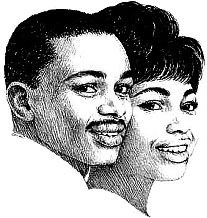 The fresh new singing stars were christened "The Sweethearts of Soul" (laying claim to the catchy title sometime in between Marvin Gaye's transition from duet partner Kim Weston to the more popular Tammi Terrell, setting up a battle over the next couple of years between the two similarly-conceived cantabile couplings). A not-so-old oldie was chosen for the second Peaches and Herb single. 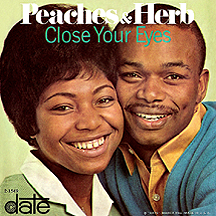 "Close Your Eyes" (written by Chuck Willis, it had broadened The Five Keys' reach as hitmakers in 1955) provided P&H with their first top ten ranking in May '67. For the time being, the formula had been established: Bert Keyes handled the arrangements on a series of '50s remakes done in a smooth soul style, Francine's sweetly seductive sound enhancing the finished takes. 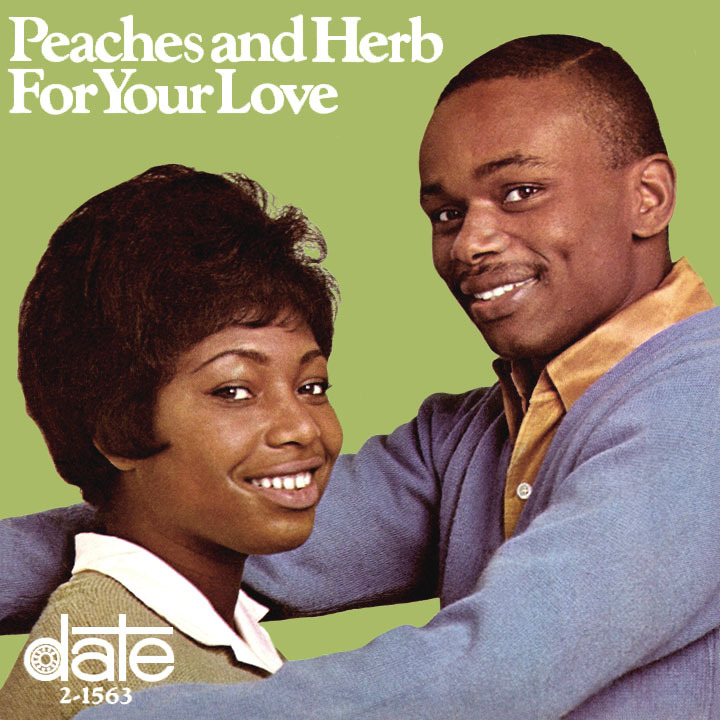 "For Your Love" (Ed Townsend's 1958 hit) and "Love is Strange" (Mickey and Sylvia's 1956 rock classic) both reached the top 20, making Peaches and Herb one of the top hitmaking acts of 1967. As the rock music of the late '60s was getting much harder and louder, James Brown and other soul acts were getting funkier while Sly's Family Stone would soon be taking black music to another plane. But Van and Dave knew there would be a niche for singing lovebirds (even with Detroit's Marvin and Tammi elbowing their space). But it was blessing and a curse. Soon Herb and Peaches would find themselves painted into a seemingly inescapable soft-soul corner. A more contemporary mindset fueled the next single, "Two Little Kids," a recently-penned tune by Windy City story-in-songsters Eugene Record, Carl Davis and soon-to-be fledgling soul star Barbara Acklin, which landed the only-in-public sweethearts in the top 40 for the fifth time in less than a year. In 1968 Francine decided to break away from the act, an opportunity for a solo career the likely reason. Marlene (calling herself Marlene Mack) replaced her at live shows but not yet on recording dates (she hadn't done anything as Marlina Mars since three singles on MGM in '65 and '66 had flopped). The label continued issuing singles Francine had sung on; "The Ten Commandments of Love" (a hit for Harvey and the Moonglows in 1958) and "United" (a Kenny Gamble-Leon Huff song first done by The Intruders in 1966) had mid-chart runs in the first half of the year. Francine signed with Date parent label Columbia and debuted during the summer with the McCoy-produced "Don't You Know Love When You See It" backed with "Mister D.J." (a remake of Van's minor hit as a singer from '61) under her married name, Francine Barker. Two later singles credited her as Francine "Peaches" Barker, starting with a song she cowrote with former Marvelette Georgeanna Tillman, "Angels in the Sky," and finishing with a cover of the big Classics IV tune "Traces." As with all other non-P&H projects, these records, despite lovely vocal performances from the original Peaches, went the way of the dodo. Marlene began doing studio recordings, officially taking over as Peaches number two with "Let's Make a Promise," a Gamble-Huff production from the fall of 1968. Of several Date singles through late 1970 the biggest was "When He Touches Me (Nothing Else Matters)," a top ten R&B hit in early 1969. A move to Columbia in 1971 resulted in one minor chart single, Paul Simon's "The Sound of Silence," followed by a brief stint with Mercury in 1972. It appeared they'd reached a dead end; Herb trained for and worked as a police officer in Washington, D.C. for a few years while plotting his return to stardom. Herb and Francine reconciled in '75 for a one-shot single on the obscure BS label; the disco-flavored "(Hump and Bump) Down Where It's At" was produced by Francine's husband, Cecile Barker, with Dan Sayres and Tony Camillo, whose "Dynomite" (with studio band Bazuka) was hot at the time. In 1977 Herb reconnected with Van McCoy, who suggested a new candidate for the role of Peaches, a model from D.C. named Linda Greene. "We're Still Together," the new duo's first single on MCA in 1977, illustrated just how much of a facade this third incarnation was putting across. Still, in 1978 when they moved to Polydor and began working with super-producer Freddie Perren (his post-1969 resumé loaded with hits by The Jackson Five, The Miracles, The Sylvers, Tavares and others) on material he'd written with Dino Fekaris, tremendous results were achieved. "Shake Your Groove Thing," a formula disco thumper, went top ten in March 1979 and quickly sold a million. This smash was followed by a sequel (of sorts) to the decade-old hit "United"...and it felt so good! "Reunited" went to number one in May, the year's top love song (and antithesis to the year's top breakup song, Gloria Gaynor's "I Will Survive," also a Perren-Fekaris creation). There were two more sizeable hits, "We've Got Love" and "I Pledge My Love," by the time the Grammys rolled around in February '80. 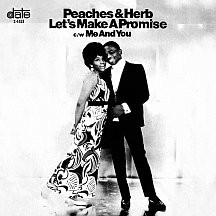 Peaches and Herb found themselves in the loop with a nomination for "Reunited" in the category Best Rhythm and Blues Vocal Performance by a Duo, Group or Chorus (composers Fekaris and Perren were also up for Song of the Year and Best R&B song). The tertiary "Sweethearts of Soul" continued recording for Polydor, and later for Columbia, through 1983 before Herb returned to law enforcement for several years. In 1990 he recruited a fourth Peaches, Patrice Hawthorne, for 12 years of regular performances. Then number five, Miriamm Wright, took over. Others have taken on the role as he ages while each Peaches seems to get a little younger! For a half-century, Herb Fame has immersed himself in delivering passionate lyrics, very much in love the entire time...with one woman: his wife Yvonne, whose nickname is definitely not "Peaches."